Easy Bake Oven. Photo by Museum staff. I never had an Easy Bake Oven as a kid. Maybe that’s why it was a special thrill when I got to buy one as an adult…as part of my job. The only problem is that I never had a chance to play with it. The classic domestic toy went right downstairs into the Museum’s collections department and now sits on a shelf in House & Home, our new exhibition on the history of American residential architecture. The Easy Bake Oven is smaller than I’d imagined it, but I’m sure I could have made a really good brownie with that thing. Maybe I still could. We gathered almost 200 household objects for House & Home, many of them from historical societies and museums across the country, as well as from private donors. We also bought a lot of things at antique shops, flea markets, on eBay, and one last-minute item at a local hardware store. This was truly a team effort—we solicited items from staff, volunteers, and our Board of Trustees members, one of whom donated what I’m sure was a prized family heirloom: a 1960s princess telephone. Shopping on eBay is not as easy as you might think. There was a surprising amount of competition for seemingly forgotten items! One afternoon, I got into a bidding war, which I lost, for a paint-by-number kit. I try not to tell that particular story at dinner parties, in case other guests may have had disparaging days at work involving grander matters. Never fear: another paint-by-number kit—this one on velvet, even better—came along the next day and I snapped it up for the exhibition. Occasionally, I heard from people asking why in the world I wanted their old fondue set or a particular sheet of music. Since they could tell from my address that I was buying their item for a museum, several people wondered if I didn’t know what a Slinky was and suggested that maybe it did not belong in an exhibition in our nation’s capital. The most fun shopping trip of the year occurred when the exhibitions staff went to Frederick, Maryland. The town’s antique stores are filled with a wide variety of what might, in some circles, not be considered museum-quality objects. We all agreed on the beautiful wicker chair but were less sure when deciding among various sets of kitchen containers and vessels. Was the chrome more interesting? Did the other set have a more unusual pattern? We already had a Hamburglar juice glass, but what about a Kentucky Derby collectible glass? As you can tell, the decision-making process could be agonizing. Though at times it seemed like an untraditional curatorial process, the wall of domestic objects in House & Home has turned out beautifully. The objects cover a wide range of household activities, regions, and time periods. They inspire visitors to discuss their own experiences with objects they’ve encountered before, while learning about other items for the first time. We hope the dramatic display will get people thinking about how such household objects both shape and are shaped by our daily experiences at home. The stuff that fills our houses can tell many stories—about the industrial revolution, improved water and sewer systems, the use of new materials, increased leisure time, changes over time in gender roles, and much more. 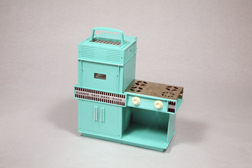 Meanwhile, if the aqua-colored Easy Bake Oven ever goes temporarily missing from the galleries, you’ll know why. The Home Depot Foundation is the presenting sponsor of House & Home. Additional support is provided by the National Endowment for the Humanities, among others.